Titanium Ore is the rare ore in Northrend. It sells from 7 to 30 gold each depending on your realm and whether or not its even available for sale and whether or not someone wants some. Its mostly bought by players who want to make end-game level 80 gear for fun, need a Titanium Rod for enchanting or are having a hard time leveling their profession. It’s good to have a few of these posted on the auction house at all times to make sure that you can capitalize when someone is in search of Titanium. Post a variety of small and big stacks of ore and bar on a consistent basis and you will have good success. You should be at least level 79 and have level 450 mining. 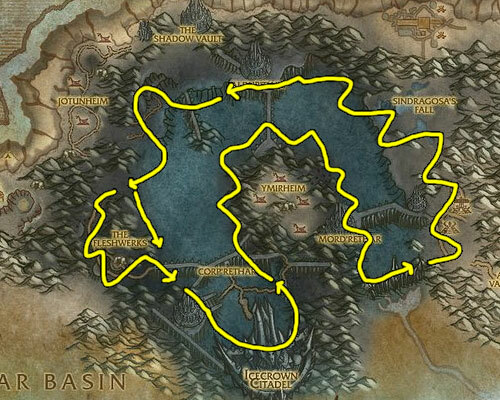 You are also going to find a lot of Saronite Ore, since it shares the same spawn locations as Titanium Ore. Don’t skip Saronite Veins, especially if you are mining for a long time. If you empty a Saronite Vein it might come back as a Titanium Vein. Update: You can make a lot of gold with Titanium Ore, but if you want to step it up and make thousands of gold you should read my personal favorite guide. Yea guide works soooooo great spent 4 hours farming and walked away with 1 whole stack! Thanks for the info man. Results may vary. I test every route here and it wouldn’t be on this site if it didn’t work at some point. When players like you comment I recheck the routes to see if they still work. Why is WoW so full of sarcastic, linguistically challenged prigs? Frankly, if you spent four hours in fruitless videogame labor, you only have yourself to blame. Love your guides mate but fail on this one. 2 hrs for no Titanium ore until I left and scored on in wintergasp on way out. Let me know if u can find better,Love your work thanks. If you really want to make use of a great tool for farming nodes, use zygors and just set it for what level nodes you want to farm, ie level 400 will take you to all the cobalt mines. pathing is similar to how they have this set up. mad stacks of ores in an hour for prospecting or mining.